Rudolph or Rudolf (Latin: Rodulfus, French: Rodolphe; c. 890 – 14/15 January 936) was the elected King of France from 923 until his death in 936. Prior to his election as king, he was Duke of Burgundy and Count of Troyes from 921. 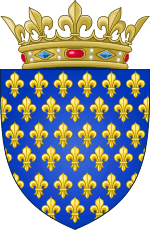 He was the son of Richard, Duke of Burgundy and Adelaide of Auxerre inheriting the Duchy of Burgundy from his father. He married Emma of France, daughter of king Robert I of France. He is frequently confused with his uncle Rudolph I of Burgundy. Rudolph was elected king of West Francia in 923 by an assembly of Frankish nobles, to succeed his father-in-law Robert I who was killed in battle against the deposed king Charles the Simple. He was crowned by Walter, Archbishop of Sens at St.Médard in Soissons on Sunday, 13 July 923. On assuming the crown he passed the Duchy of Burgundy to his younger brother Hugh the Black. In contemporary Latin documents, his name is usually Rodulfus, from the Germanic roots hruod, "glory", and wulf, "wolf". Rodulf and Rudolf are variants of this name; the French form is Rodolphe. By contrast, the king is normally known as Raoul in modern French, a name which derives from Radulfus, from Germanic rad, "counsel", and wulf. Although this name is of different origin, it was sometimes used interchangeably by contemporaries with Rodulfus. The king himself, however, always, used Rodulfus, as on his personal seal. Nonetheless, he is sometimes called Ralph (from Raoul) or Radulf in English. The deposed Charles the Simple was still alive and claimed the throne. This was solved when Rudolph's brother-in-law, Herbert II, Count of Vermandois, who was married to Emma's sister, tricked Charles, a fellow Carolingian, into meeting and then took him prisoner. Rudolph's first act was to lead an army against the king of East Francia Henry the Fowler, who had made a pact with King Robert I at Jülich earlier in the year. After trying to annex Lotharingia Henry met Rudolph with a considerably-sized army and made peace again. However, in 925 Henry attacked Gilbert, Duke of Lorraine and took over Lotharingia permanently, Rudolph being in no position to resist. In 924 Vikings made a fresh series of raids into West Francia. From the Loire Valley they threatened Hugh the Great, brother of Queen Emma, but Rudolph did nothing. Soon they attacked Burgundy, domain of Rudolph's brother and were repulsed, moving on to Melun, where they threatened the royal lands. Joined only by his ecclesiastic vassals and Herbert, he recruited troops in Burgundy, while Hugh the Great was convinced to join him. After Vikings left, the Normans, whom Charles the Simple had settled in Duchy of Normandy in 911, began ravaging that whole region. Herbert and Arnulf I of Flanders joined Rudolph and together they took Eu, but were ambushed near Fauquembergues where the king was wounded, the Count of Ponthieu killed, and many Normans left dead on the field. ↑ Jean Dufour, Recueil des actes de Robert Ier et de Raoul, rois de France: 922–936 (Paris, 1978), p. lxvii. ↑ Stapleton, Thomas (1840). Magni rotuli scaccarii Normanniæ sub regibus Angliæ. p. lii.